One of the best alpine runs in Australia that takes on some of the most spectacular country in Victoria’s Alpine National Park. 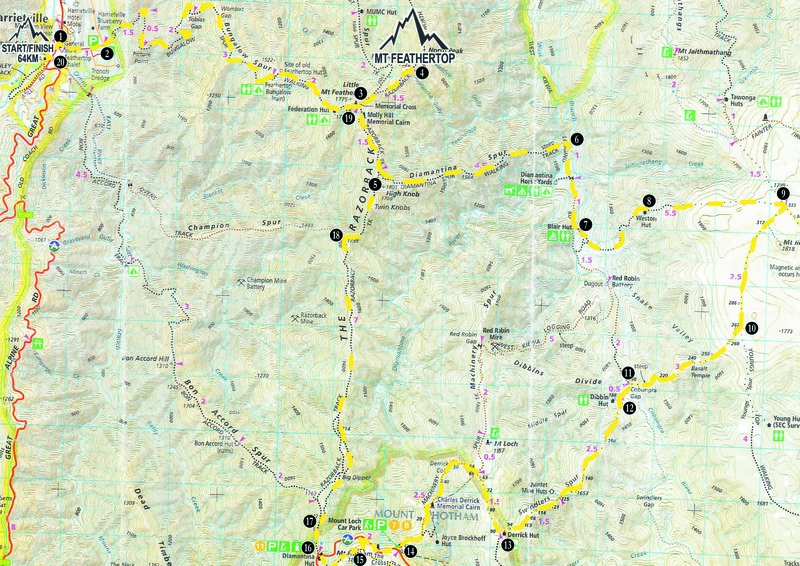 Starting in Harrietville and climbing up Bungalow Spur to the summit of Mount Feathertop then across the high plains to Pole 333 and onto Mount Hotham, back along the Razorback and down into Harrirtville. An amazing mountain run for Australia! Run through Harrietville on the Great Alpine Road (watch out for cars) past the General Store, turn right up Feathertop Lane and across the footbridge. Summit of Mount Feathertop, note that the actual summit is the second peak. Once here return to the Memorial Cross and head out along the Razorback. At the junction of the Razorback Track and Diamantina Spur head left and down off the ridge. This is one of the steepest sections of the course so caution should be taken here. Once in the bottom of the valley head right towards Blair Hut (crossing a locked barrier at 1km). After passing through the locked barrier across the road take the indistinct track down to Blairs Hut. There is a small clearing with a large “to” to mark this obscure turn off, on the left hand side of the track. Head down and cross the creek then head up past Blairs Hut. Pole 333 checkpoint. 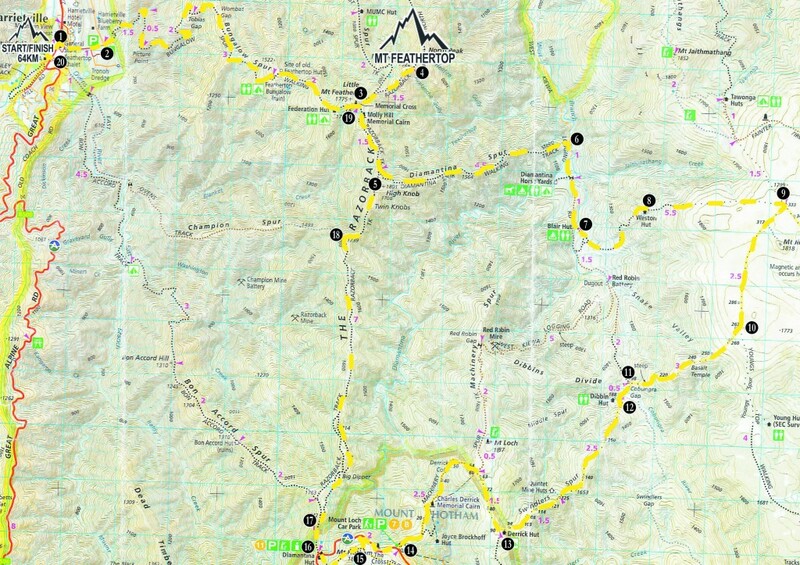 Here you turn right towards Cobungra Gap and Mt Hotham on the Alpine Walking track following the numbered poles. Cobungra Gap, turn left here and head down to the river crossing at the footbridge. At the saddle (Memorial Cross) take the marked track to the left and down Bungalow Spur back to start finish.